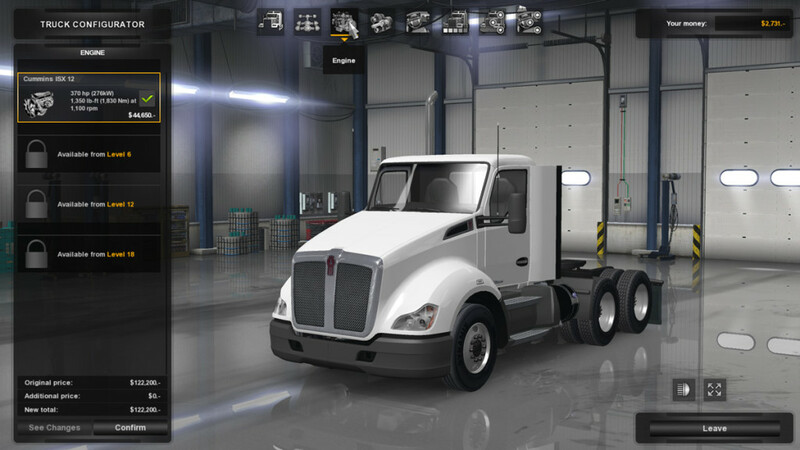 After purchasing and downloading ATS from Steam, I fired up the game to gather some initial impressions. 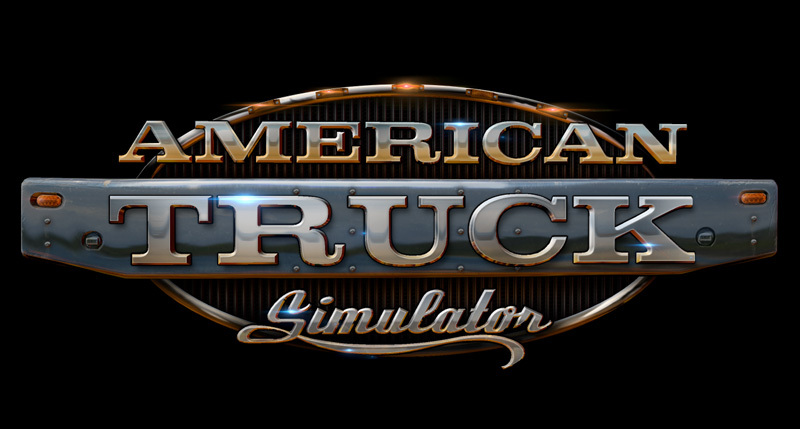 While I own Euro Truck Simulator 2, I’ve probably only spent a few hours with it, so I would be approaching ATS from a novice viewpoint. 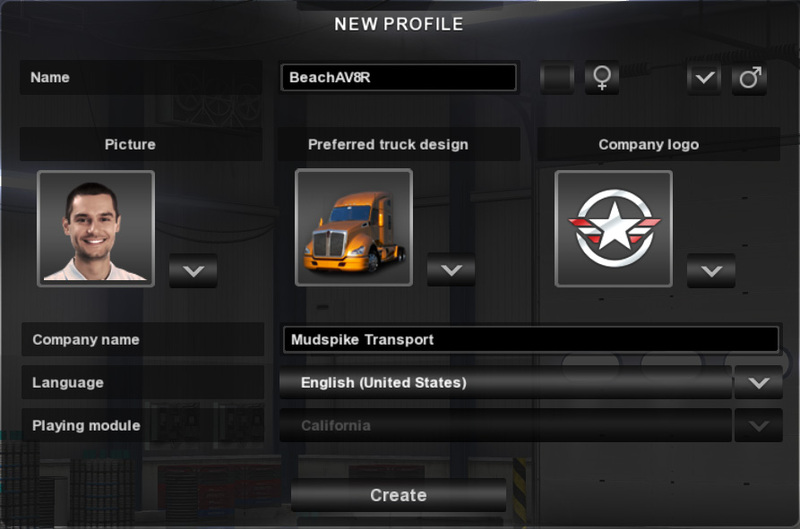 On opening the game, you are presented with menus to create a profile with a character photo, a truck, and company logo and name. Difficulty levels can be tailored to your preferences and hardware. I’ve been playing the game using an X-Box wireless PC controller and it works great. I have a Logitech MOMO that would no doubt be a better choice, but I haven’t wanted to swap out hardware on my desk lately, so I have no reports on how it works with that. 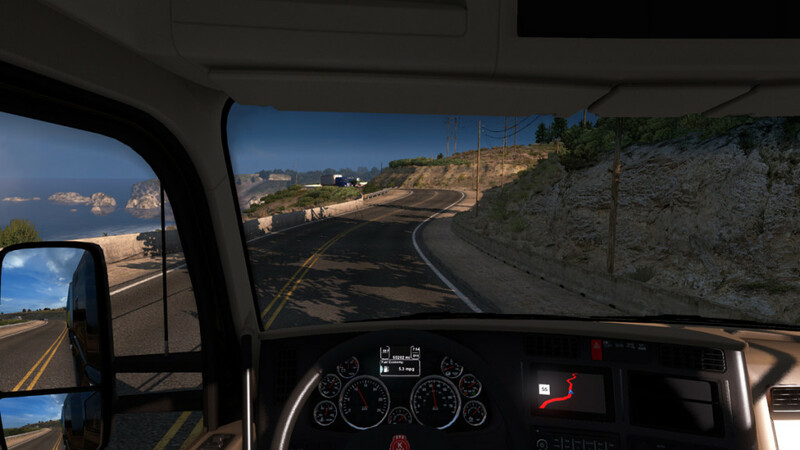 The selections include different shifting options that range from automatic to actual sequential shifting and other controls such as trailer brakes that can be assigned to your hardware. 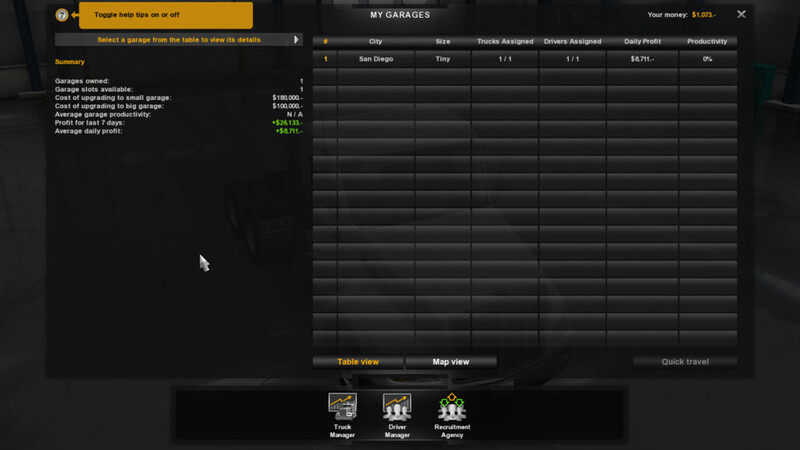 In the career mode you select a home garage for your new company. 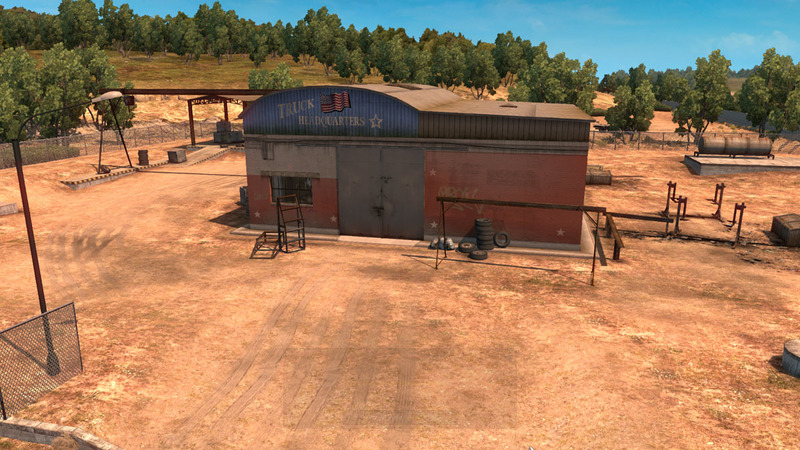 Other areas of the map have upgraded garage facilities that you can purchase once you earn enough money and grow your company. When you launch a career you only have a limited amount of money, so you typically start out by driving jobs for other companies to build up cash. 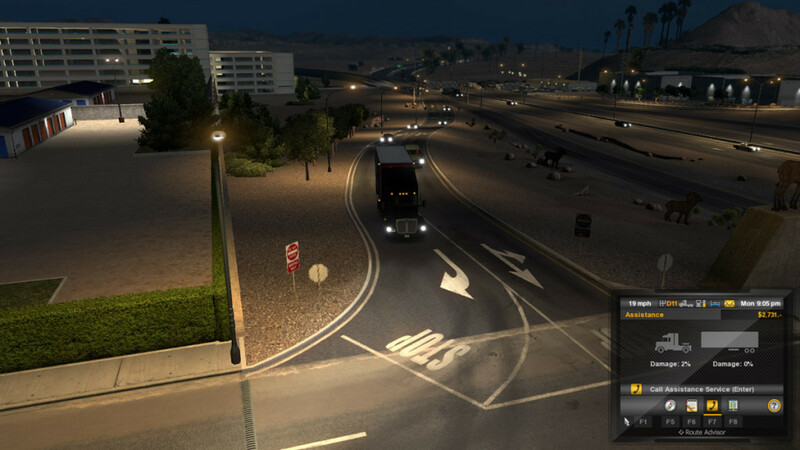 You can select routes that appeal to your desire to explore the map, or you can go for maximum cash per mile, or perhaps you want to drive a certain type of cargo – it is up to you. 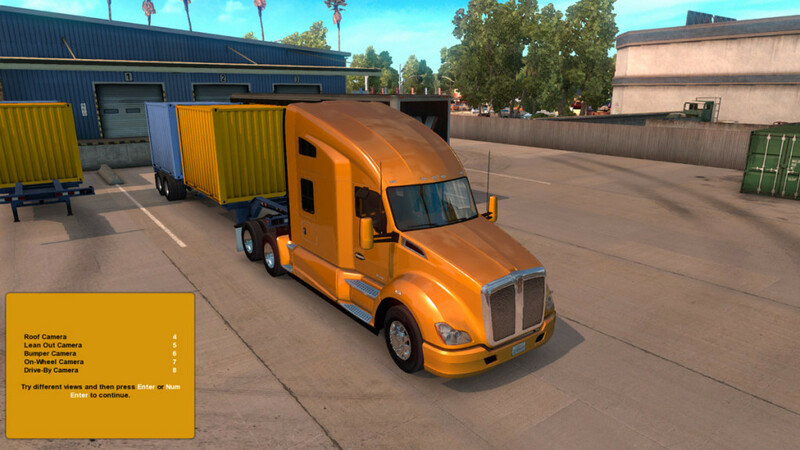 Route length and type of cargo determines the payment and allows you to tailor your session length to the time you have available. 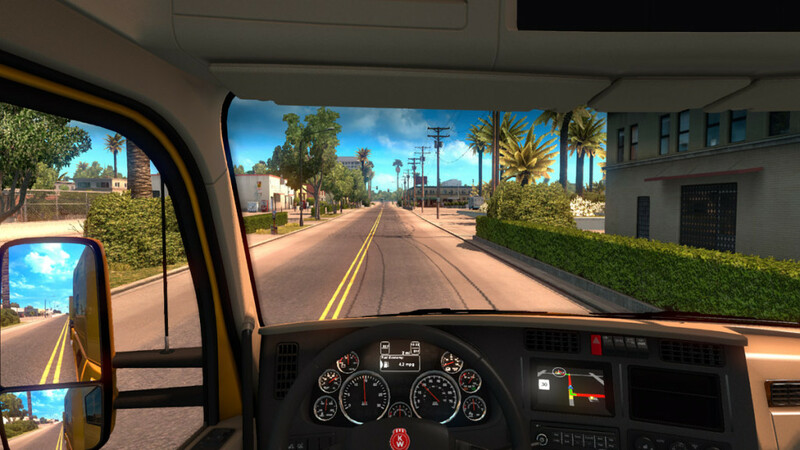 Once you select a job you are plopped into the cab of the truck you have been contracted to drive. 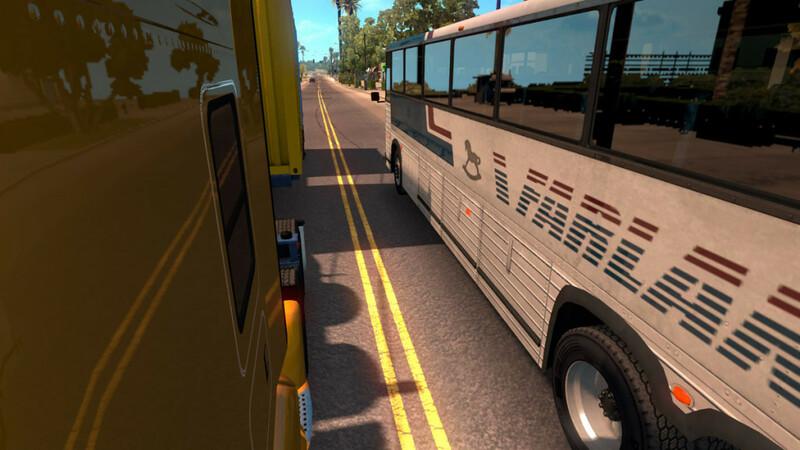 If you are driving a job for another operator (using their equipment) then you are instantly placed in their rig at the start location with the trailer already hooked up. 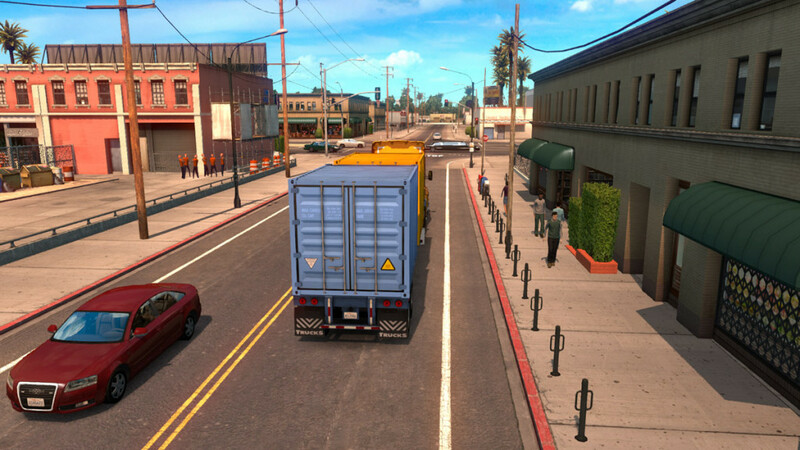 Later in the game, when you buy (or lease) your own truck, you will be responsible for driving to and from the job locations, so that is an important consideration when selecting where you choose jobs. 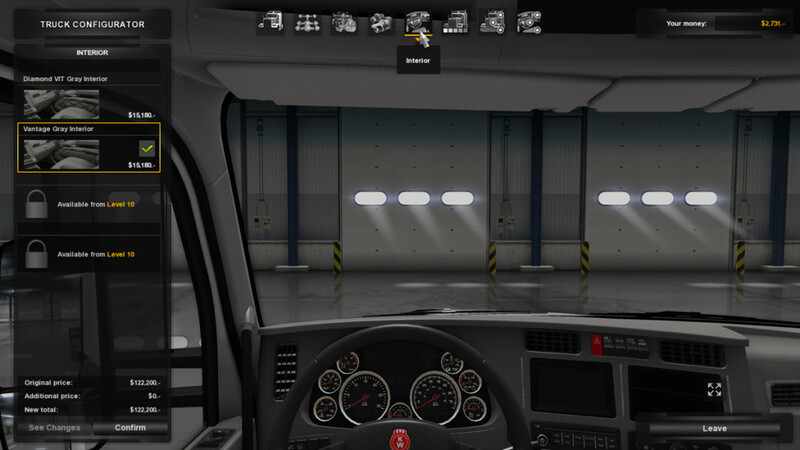 The truck cab is nicely detailed and there are many adjustments to positions and displays that you can set. (I have not tried TrackIR yet!) 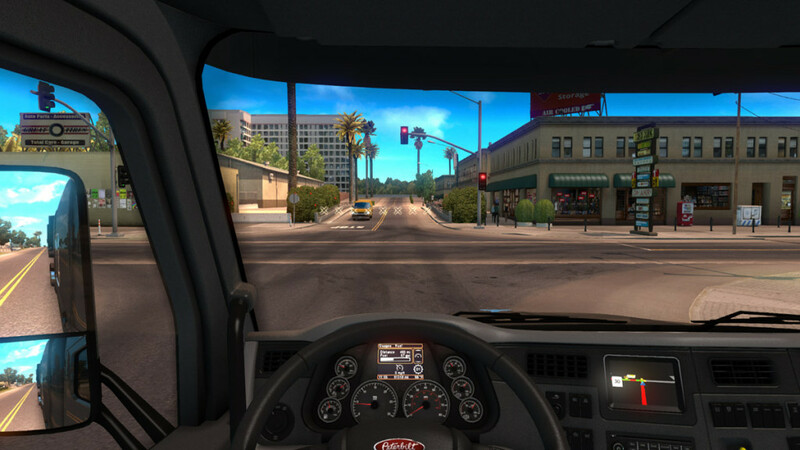 Exterior views include top down views, tire views, panning views, drive-by, and a few others that will help you maneuver your truck into tight spaces. 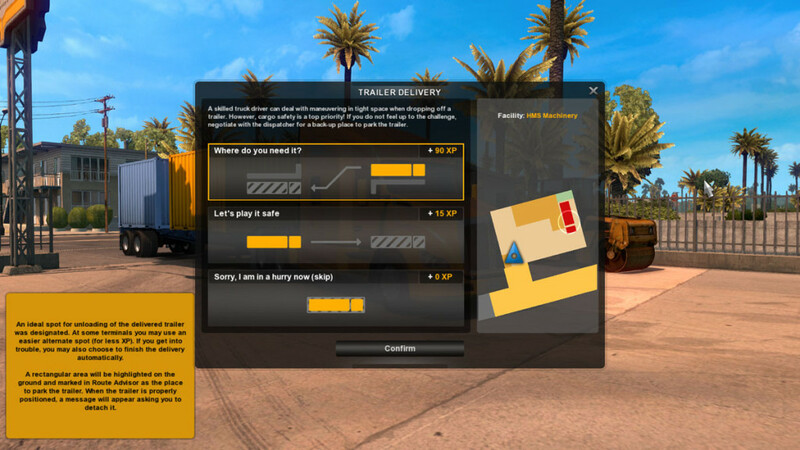 During your first drives, tips and hints will pop-up to introduce you to the game mechanics and features. 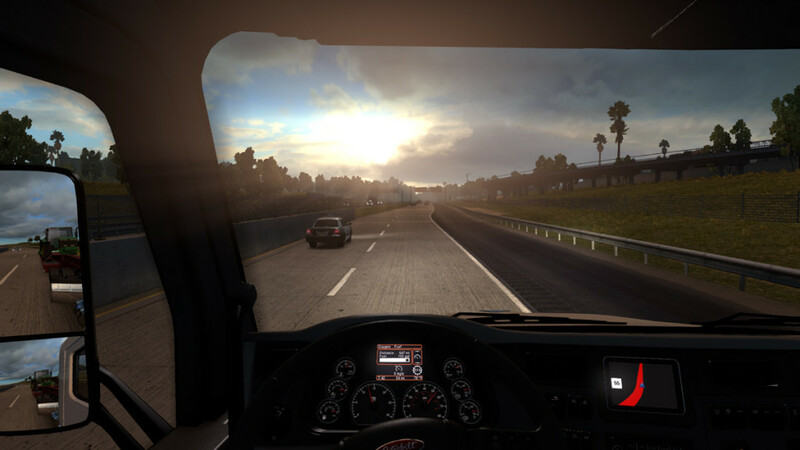 I elected to use the “Real Automatic” driving mode, which simplifies driving to just using my controller button to select reverse, neutral, and drive while the automatic transmission handled gear shifting. 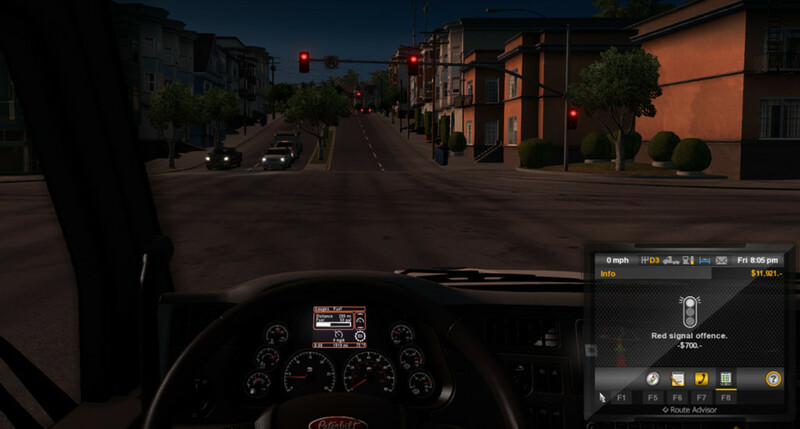 The X-Box controller works great by assigning steering and accel/brake axes that allow for fine control of the truck. 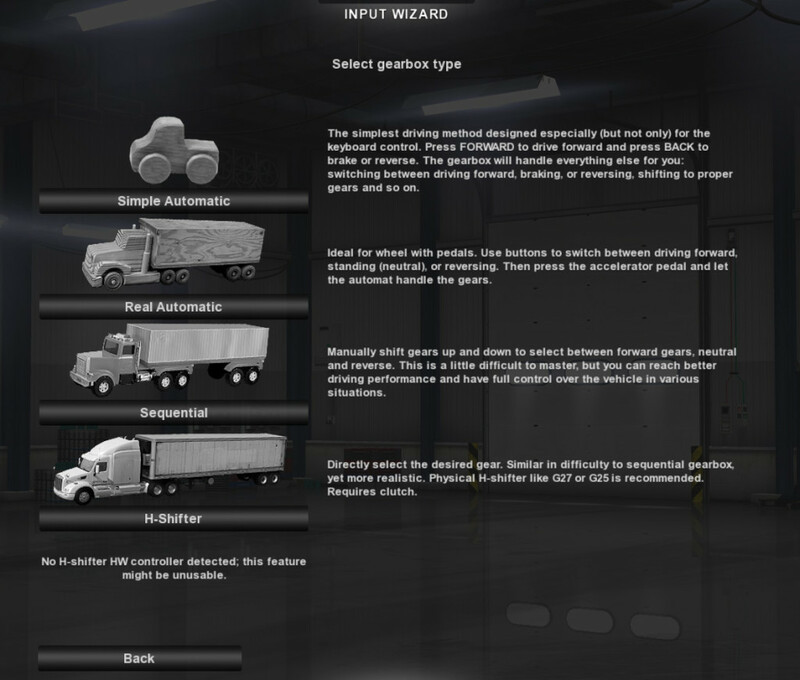 While truck control difficulty is fairly scalable, the game sort of stays consistent in it’s driving difficulty. 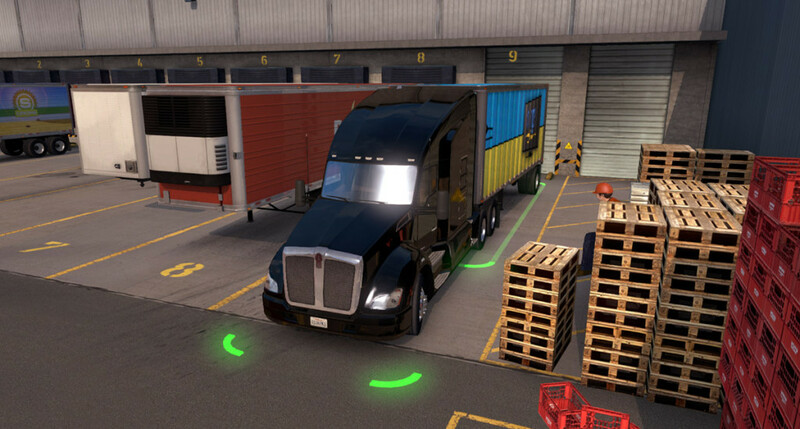 For instance, my first job had a fairly tight maneuvering exit from the trailer dock that required a very slow and methodical approach – a lot of fun for sure, but I was surprised that the game didn’t start off a bit easier. On screen aids include a GPS with route prediction capability and a moving map. Also included are icons to select damage reports, the status of the current job, e-mails, and roadside assistance in case you damage something or need repair. 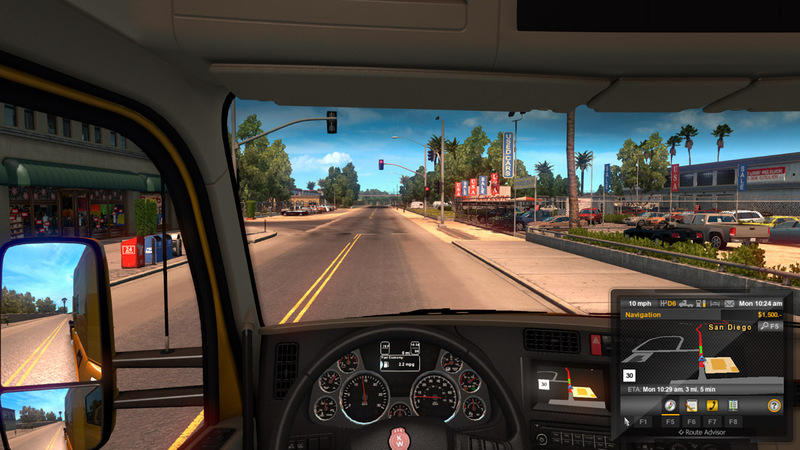 A status bar indicates truck health, driver fatigue, and time of day. Your account balance is also reflected, giving you a good gauge of your financial status at all times. 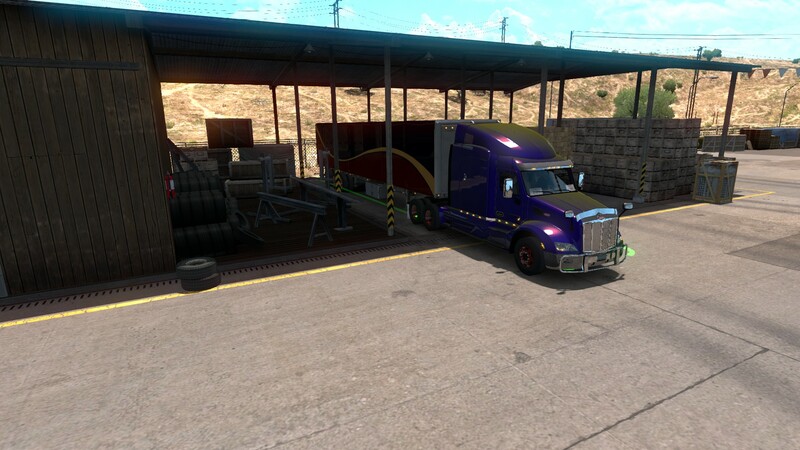 When driving for another company, fuel is paid for, so you don’t have to worry about that expense. 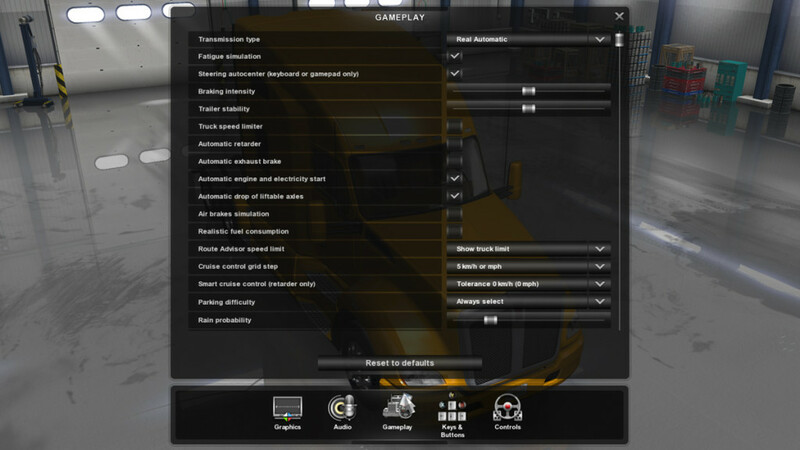 Driving on my computer was silky smooth with maximum rendering options enabled. 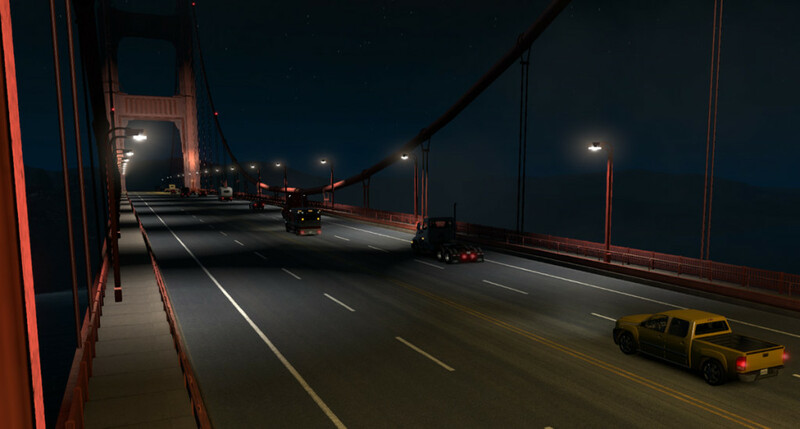 The environments are very nice and half of the fun is driving to new areas of the map to explore how SCS modeled the different regions. As one would expect, the urban areas are full of traffic, stoplights, buildings, and congestion. 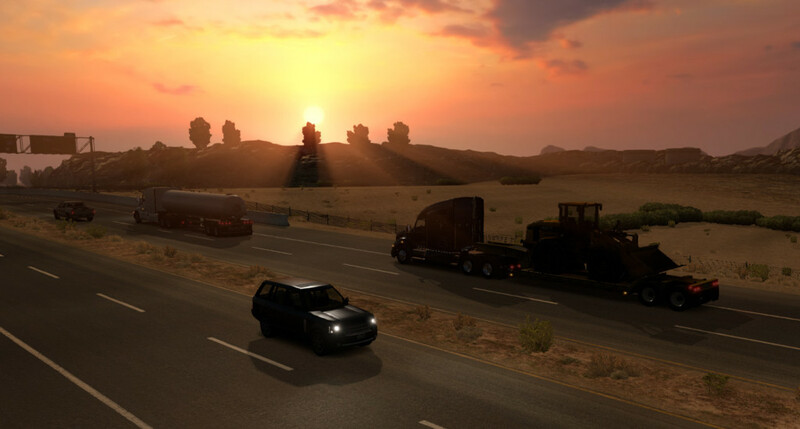 As you leave cities, the terrain gradually changes to reflect the new area you are driving to. 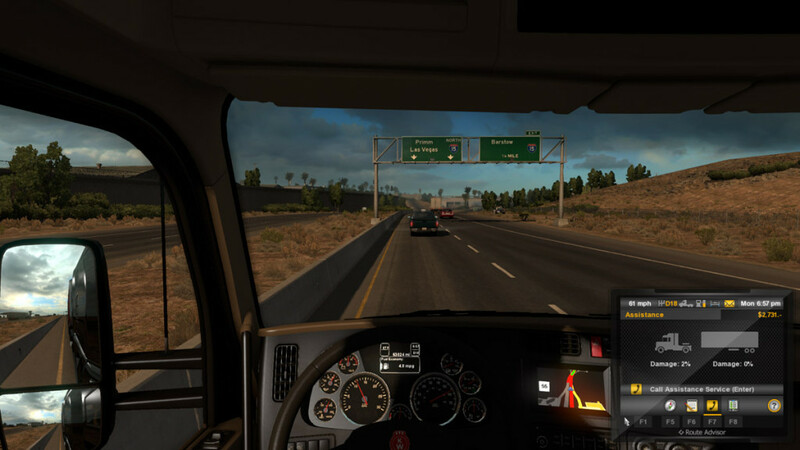 Thus, driving through California and Nevada you encounter deserts, mountains, dirt roads, straight highways, twisty mountain passes, and all manner of different scenery. 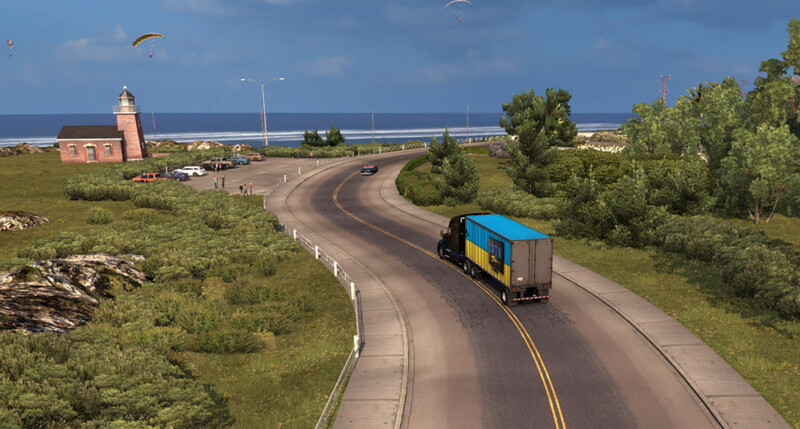 The Pacific Coast Highway is a beautiful seaside road that snakes along the coast and upon entering cities such as Oakland and San Francisco you are greeted with local landmarks that are approximations of the real thing. 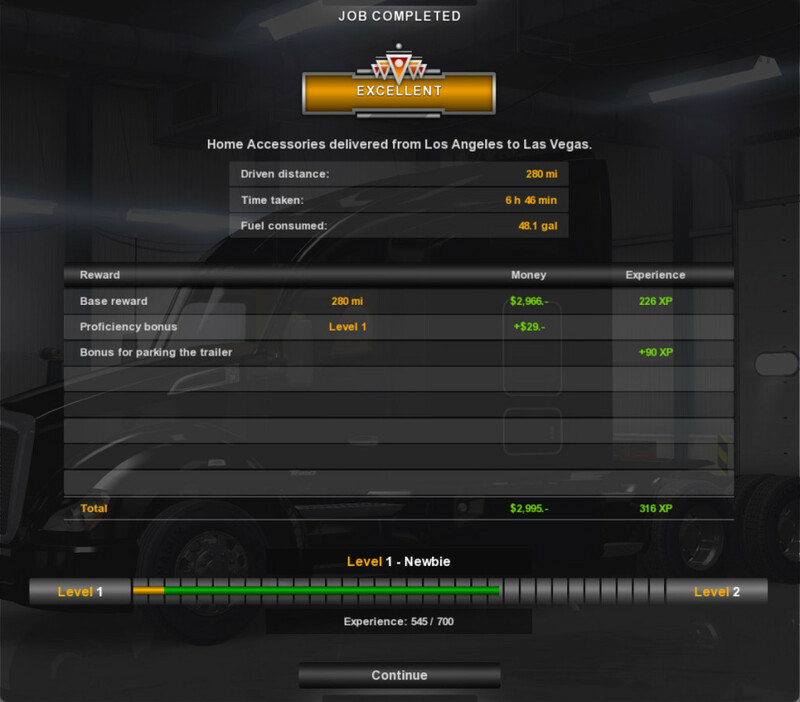 The gameplay in career mode is centered around making money and gaining experience, then turning around and reinvesting both the money and the experience points into further building your character, equipment, and business (as well as repaying debts!). 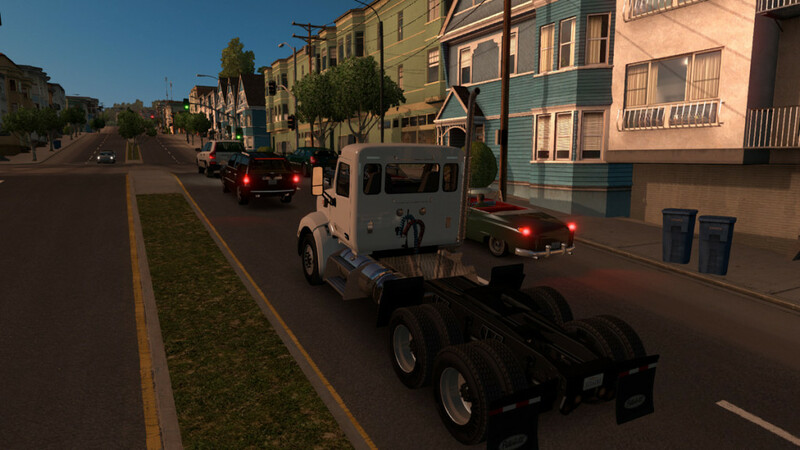 The game is chock full of ways to trick out your truck, including engines, transmissions, interior options, etc. 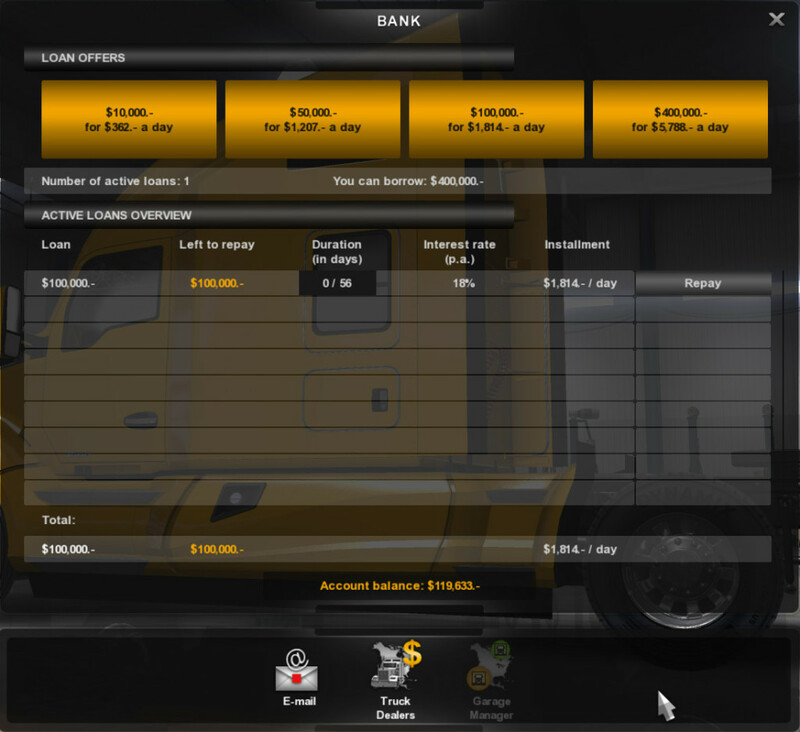 As you earn money, you can buy your own truck and start to mod it with the money you earn. To help you out, you can expect to receive offers from banks to loan you a certain amount of money. As you gain experience, the banks will want to loan you even more money. 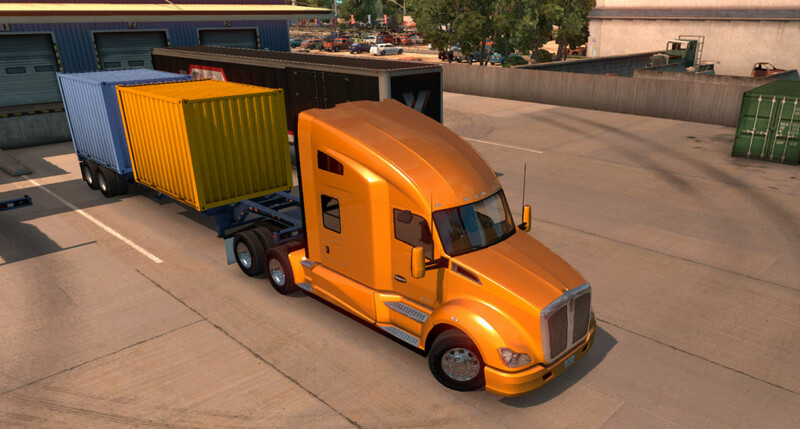 Obviously, you must make enough money on your transports to pay the bank back, provide for fuel, maintenance, and upgrades if you are modifying your truck with more advanced parts. Making enough money is not all that difficult to do, but requires an investment of time and hauling goods. It’s not all just driving point A to point B though – as you’ll get deductions from your account for damaging other vehicles, speeding, traffic violations, and things such as tolls and fuel. 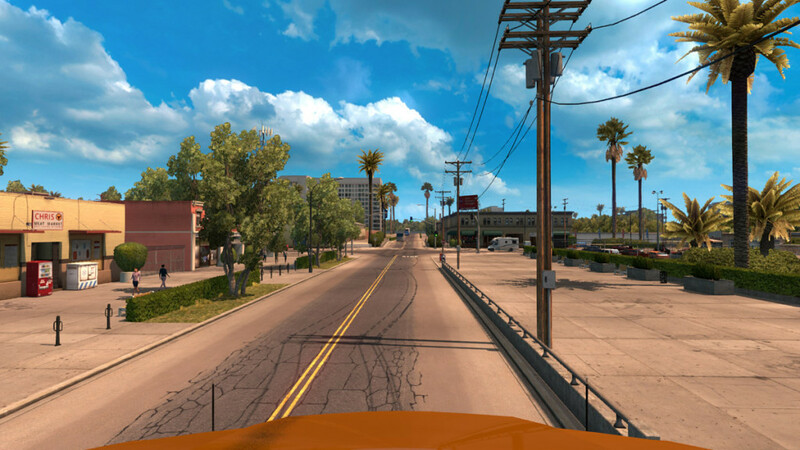 Fortunately, the game is pretty balanced in that it doesn’t automatically fine you for exceeding the speed limit – there is some buffer there to go over the speed limit. Turning right on red without signaling can earn you a ticket as well. 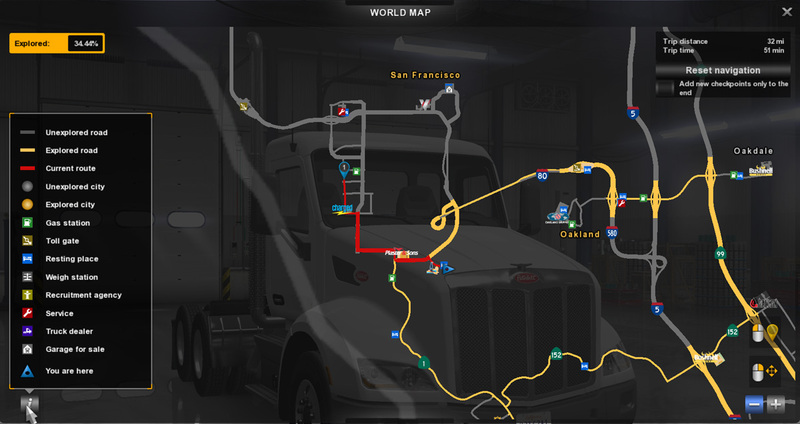 As you drive through the map areas, you will also discover new businesses and opportunities. 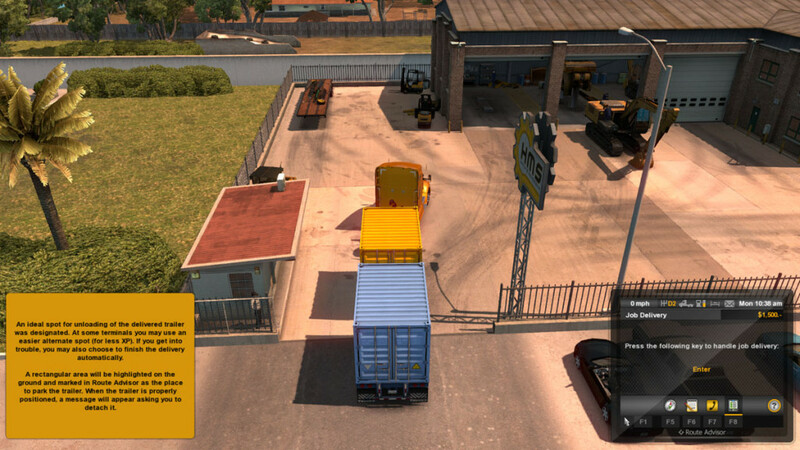 Truck dealers, service shops, banks, rest areas, and employment agencies will soon start populating your map. 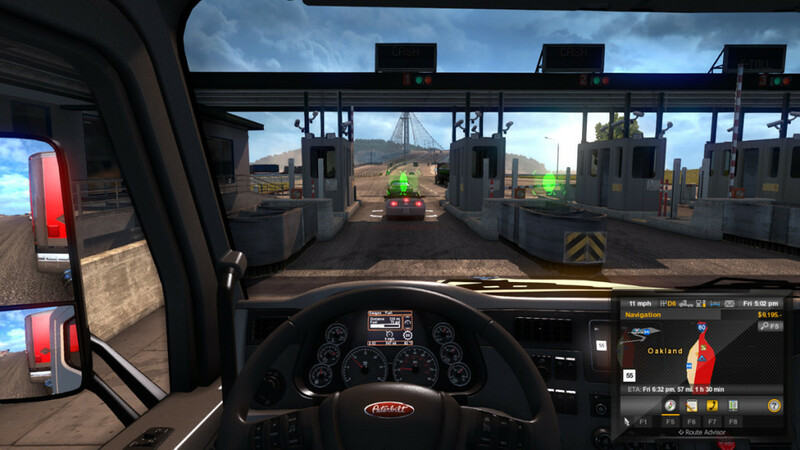 At service areas, you can spend your cash to upgrade your truck, or you can wait until you are back at your home base. 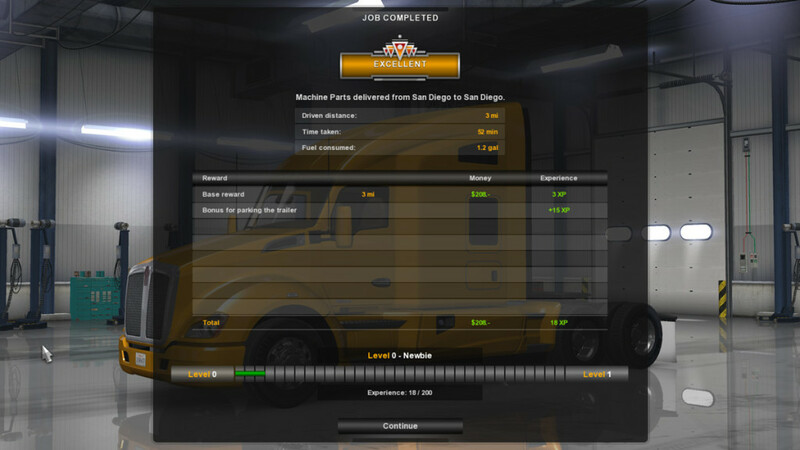 For those that want to get into management, and help grow their business faster, you can recruit other drivers, buy more equipment, and purchase a bigger home base. 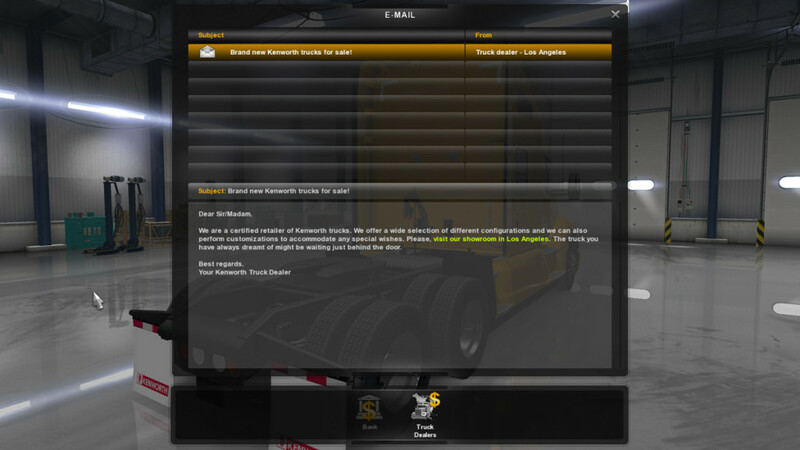 Keep an eye on your in-game e-mail for offers and specials from banks and possible employers that have lucrative jobs. I haven’t become big enough to hire anyone yet, so I can’t really comment on how that component works, but I’m guessing it is just like running any business – earn more revenue than expenses and you’ll be good to go. 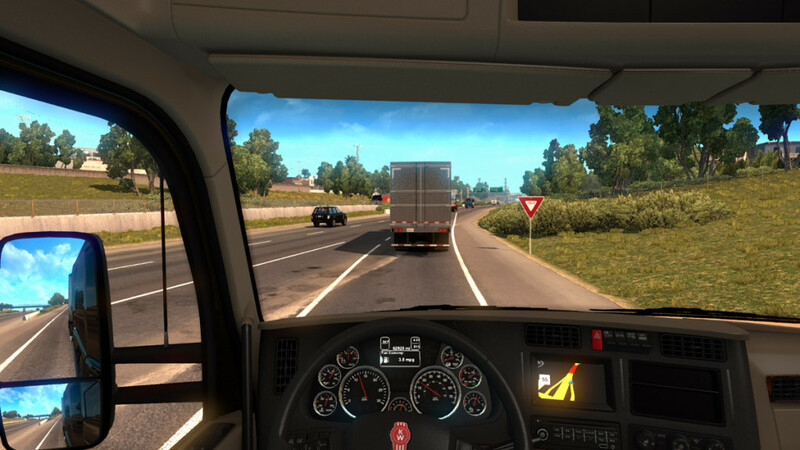 Earning money and experience can vary according to how you drive, the route you take, and some of the options you select. 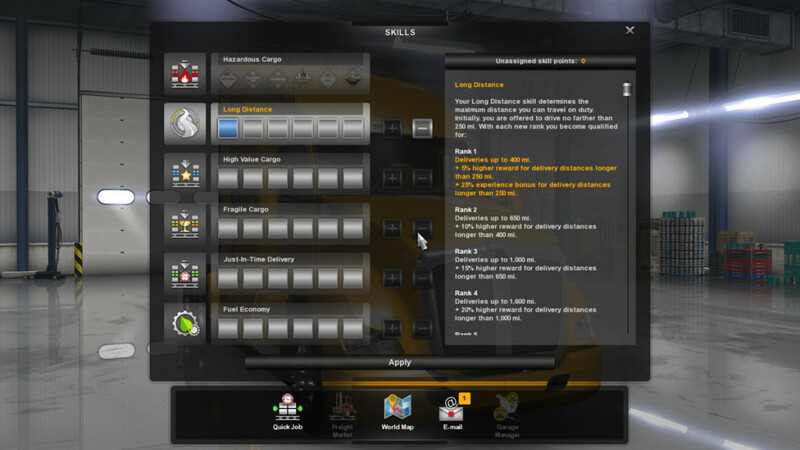 As you gain experience points, you can apply those points to build skill levels that will unlock more types of missions (high value, fragile, HAZMAT, etc.). 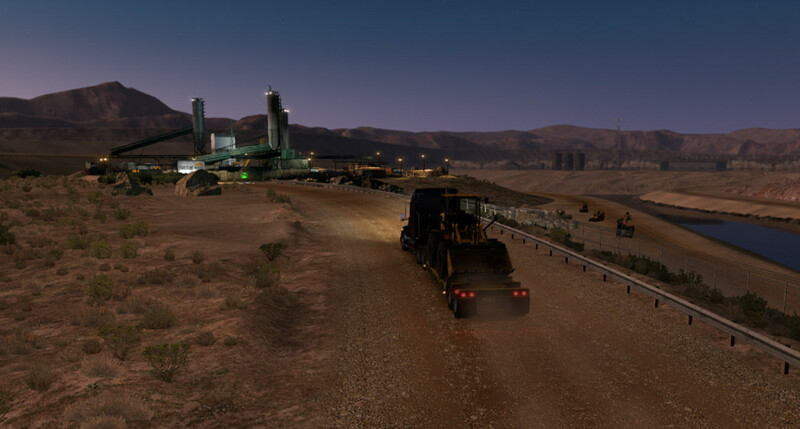 All of the levels and points are explained in detail on the menus, so there is a lot of depth to the game beyond just driving cargo around and trying not to hit things. 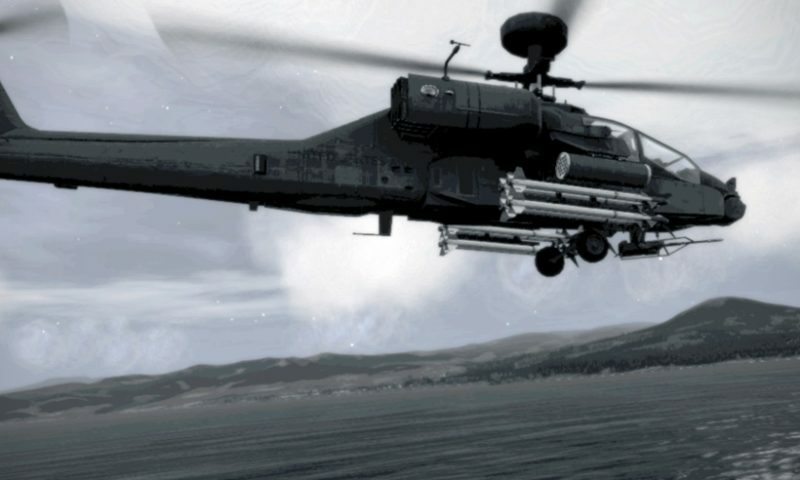 One of my favorite parts of the game (and one no doubt many people will skip) is the actual delivery portion of each mission. 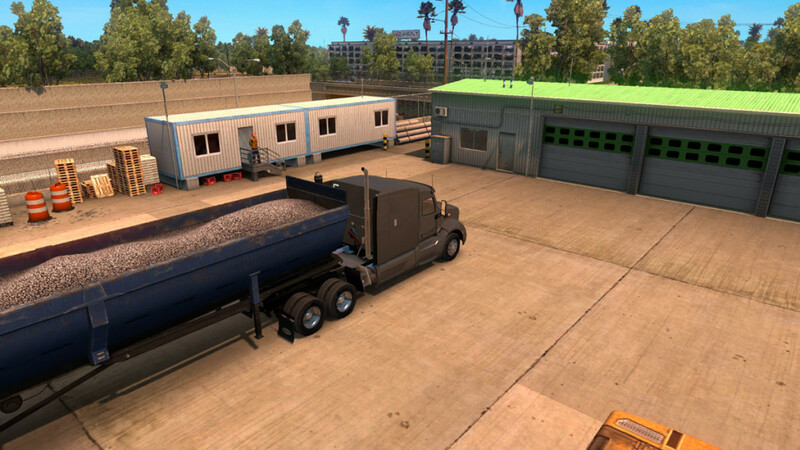 Upon reaching the delivery point, you are given the option of just skipping the parking, taking an easy parking space, or really putting the trailer exactly where the recipient wants it. 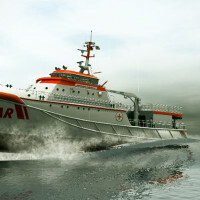 The hardest option gives you the most experience points, allowing you to ramp up the accessible missions faster. 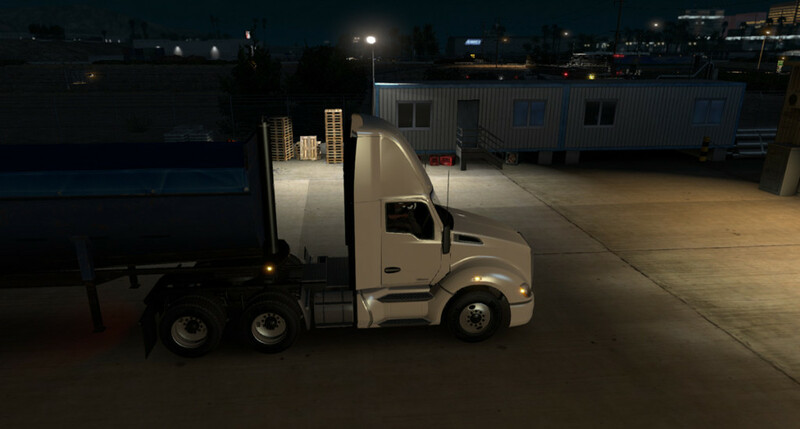 Some of the delivery points are pretty tight, and you risk damaging your cargo or truck in the process, but it is fun stuff learning to park these big rigs. It is a bit of a shame that physical damage to your rig isn’t reflected on the 3D model. 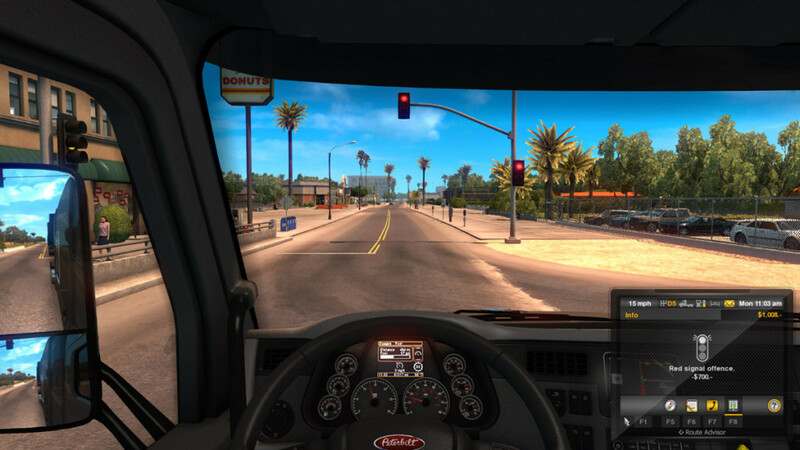 While your truck requires maintenance, fuel, and maybe the occasional upgrade, the driver can only perform if he is well rested and alert. 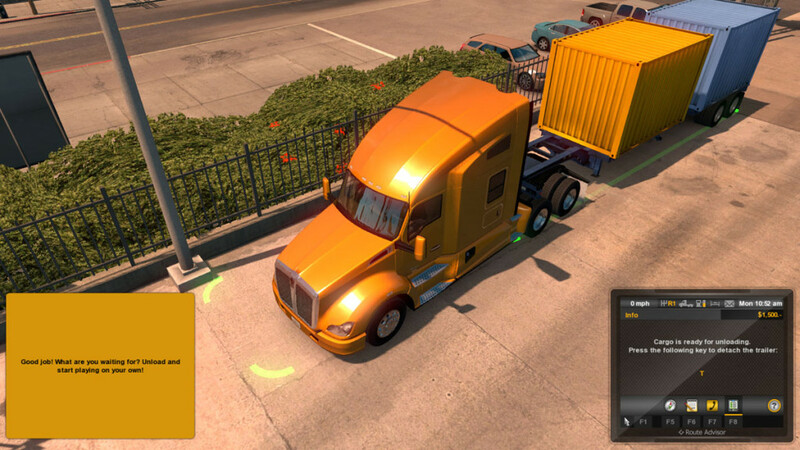 A fatigue system is in place that shows a colored symbol as you become more tired. Just in case you don’t monitor the symbol, an audible yawning sound (which scared me the first time I heard it) is played to caution you that you need to find a stopping place. 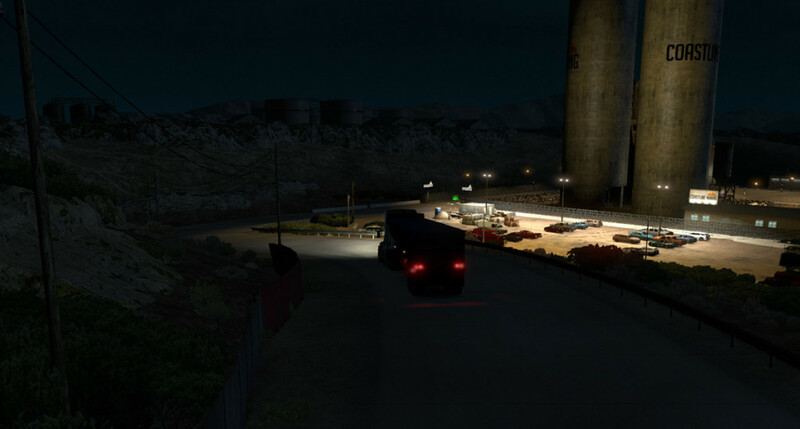 Rest areas and hotels are scattered across the map, allowing you to pull in and get some sleep. Why is this a consideration? 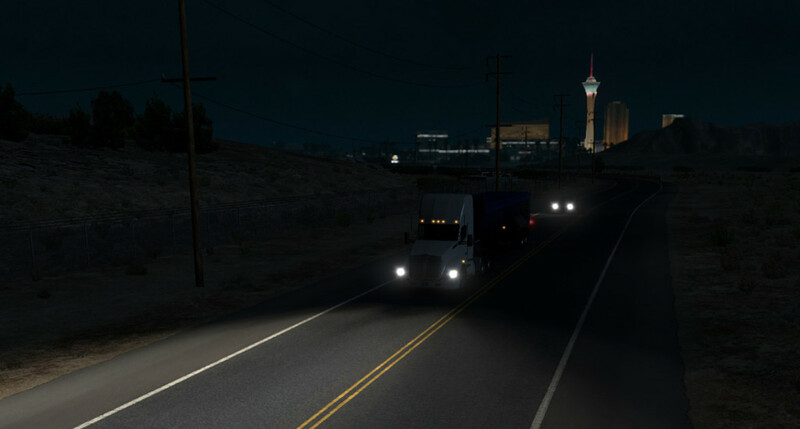 Because for some hauls you are given a certain amount of time, and while the time allocations are very generous, a broken down truck, or taking a wrong route could cause you to run up against that time. Throw in a weary driver and you could lose the job. 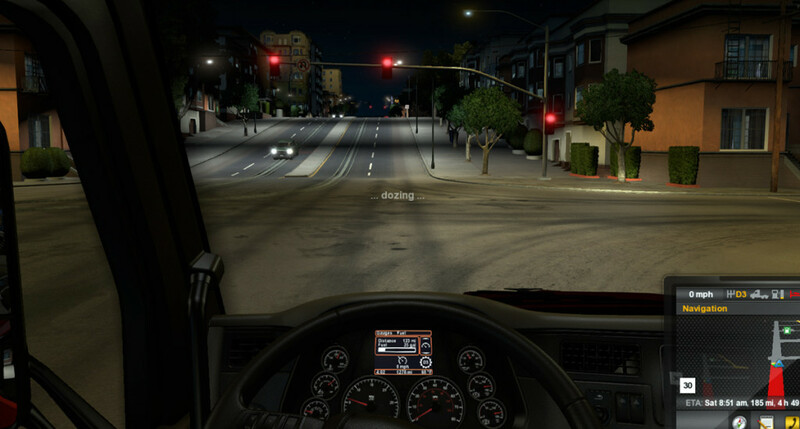 If you decide to ignore the yawning, eventually your driver will start to micro-sleep for short periods and the screen will go dim. 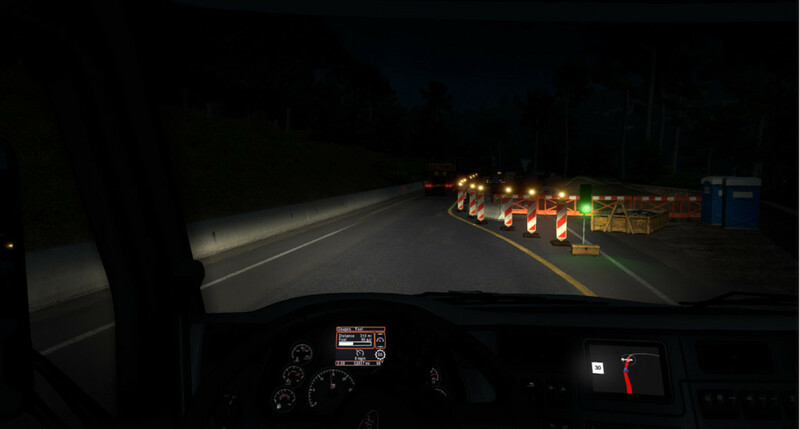 Running into the back of another truck or running off the road will quickly earn you several thousand dollars worth of damage, so ignoring sleep is to flirt with disaster. 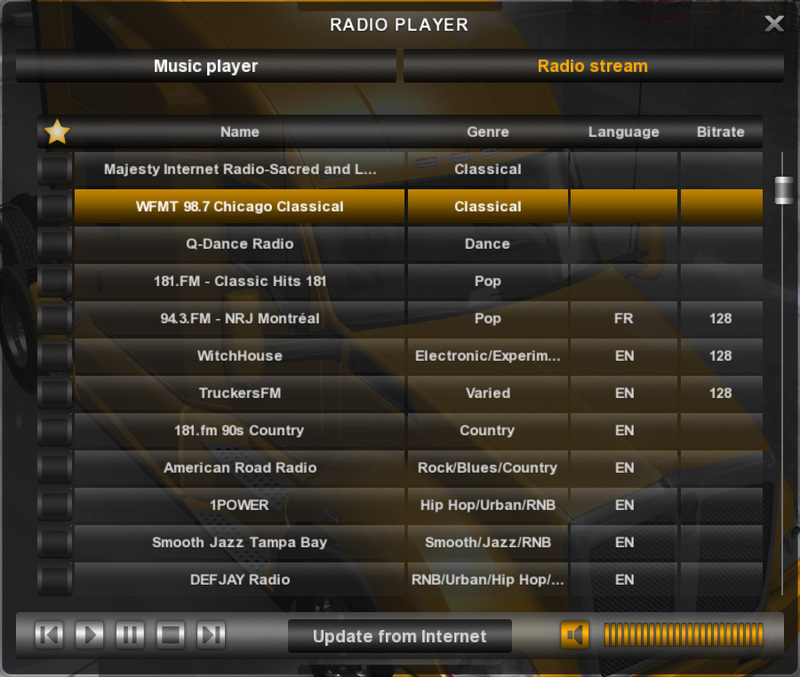 If you are struggling to stay awake, perhaps tuning in to the radio stations that are streamed live from various sources on the internet will help you stay focused. 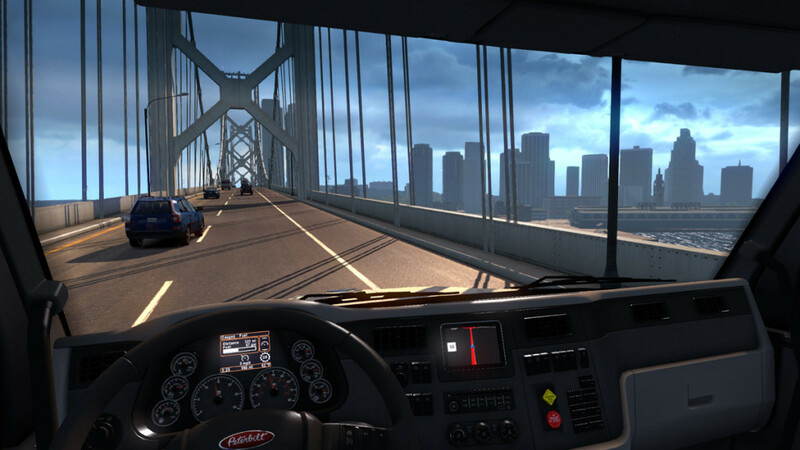 Now, ATS is probably not a game for everyone – it does involve fairly repetitive activity. 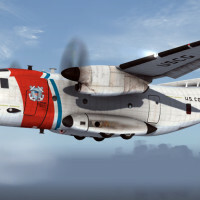 Flight sims could borrow a page from the career building aspect of the game though in that you do become vested in your character, your company, and equipment. 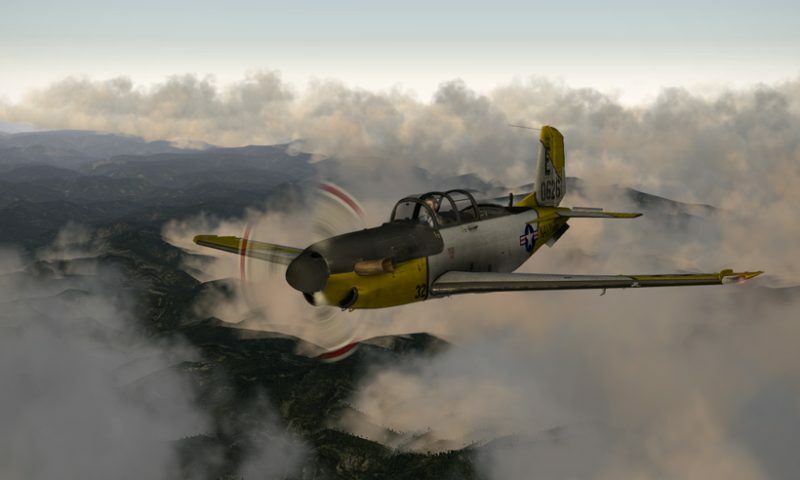 It would be nice to see a flight sim approach the “gamer” portion of their audience with a similar resource and experience building model. 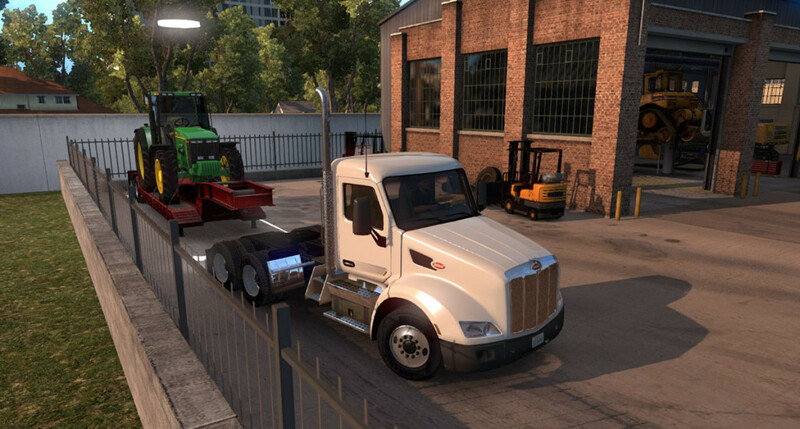 That said, you can just drive single transport missions all day long in ATS and not worry about the deeper aspects of the game, or you can dive headlong into building up a huge shipping business – the choice really is yours. I’m unable to comment specifically about the more advanced career options available, such as hiring drivers and buying more trucks, since I’m still working my way up the ladder. 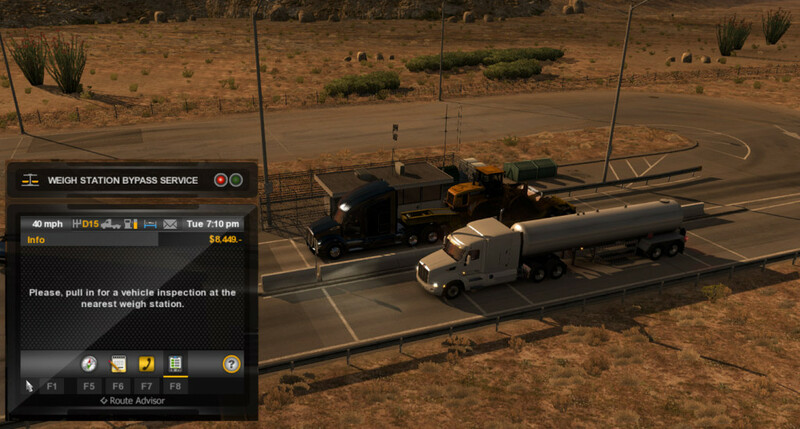 According to SCS – the next state expansion will be free to all ATS owners and will feature the state of Arizona. There are also apparently plans for a Collectors Edition boxed version that will have some additional merchandise within. 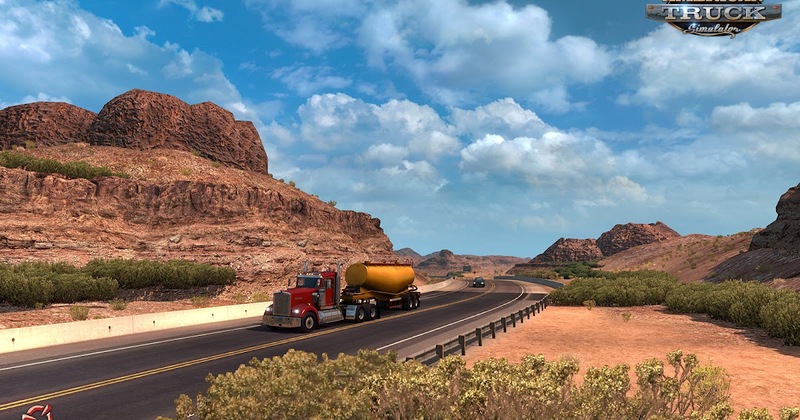 SCS has alluded that the paid DLC success or failure will ultimately determine how far the ATS map stretches – with hints of the Arctic Circle, driving to the East Coast, and South toward the equator. It isn’t hard to imagine all of the fantastic areas they could model with such diverse environments. 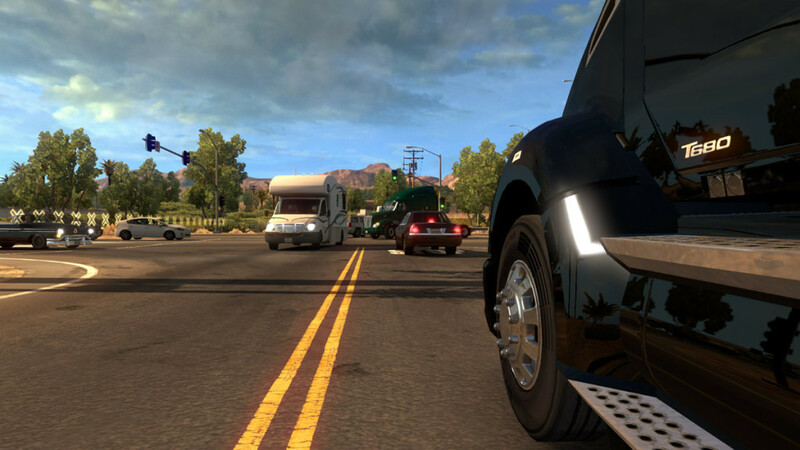 American Truck Simulator is a perfect time waster that has some nice hooks to get you involved. Exploration, career building, precise driving, and a polished piece of software with what looks to be long term support and expansion (at a cost of course) promise to give this game/sim legs well into the future. 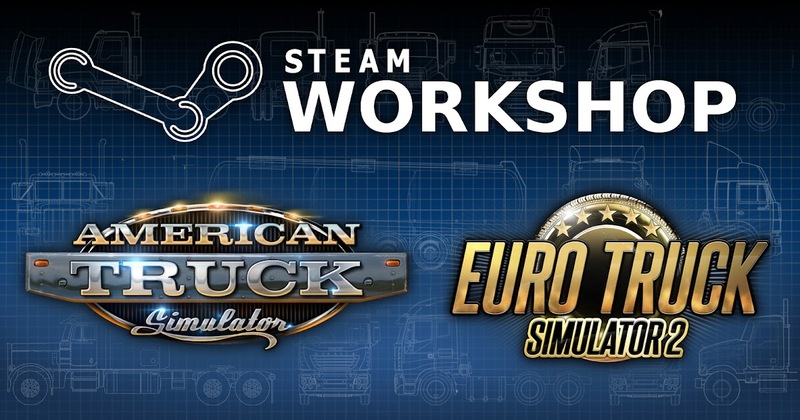 As well, mods are already becoming available to tweak your ATS experience to your liking. 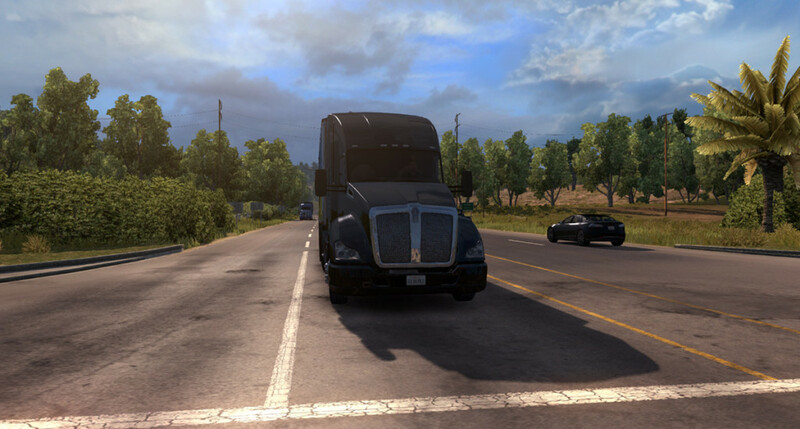 It would appear that SCS is in it for…..uh…the long haul..! Like this content? Want more of it? Let us know – we are a fledgling site and your input will help us shape our future! Nice read. How big is the map? just Nevada and California? 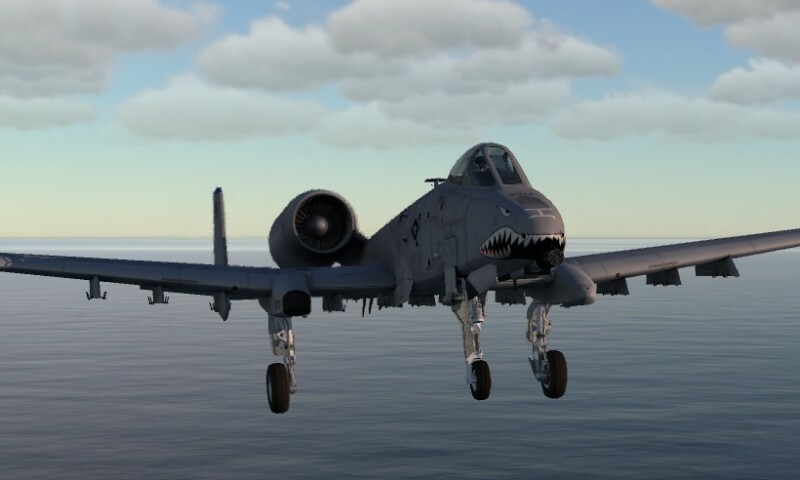 I’m with you that I’d die for a flight sim with a career mode like that. Can confirm it works with TrackIR in ‘cockpit’ and can confirm I still can’t park the damn thing while looking backwards. Nice article @BeachAV8R, as usual. TrackIR and a wheel make this game amazing, gives you time to look around and enjoy the scenery. And backing up is nice, turn your head far enough left and the view flips out to over-your-shoulder out the window view. Helps with parking for sure. @Sryan the map currently includes California and Nevada, with probably 15 cities in each state. 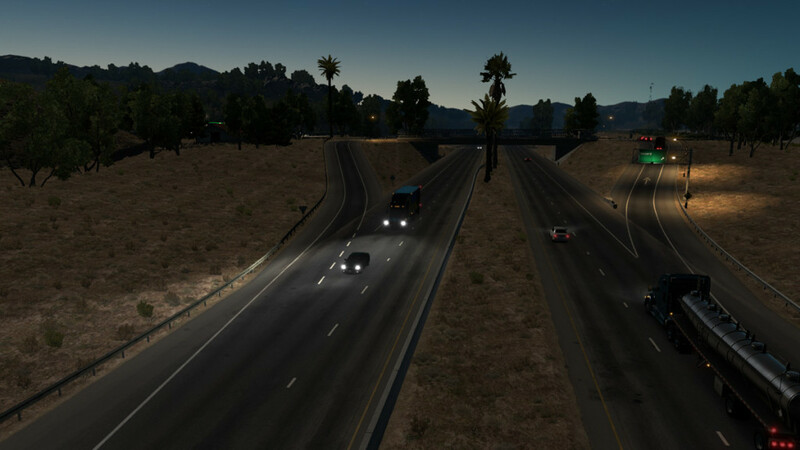 As the article said Arizona is coming soon as a free addon. 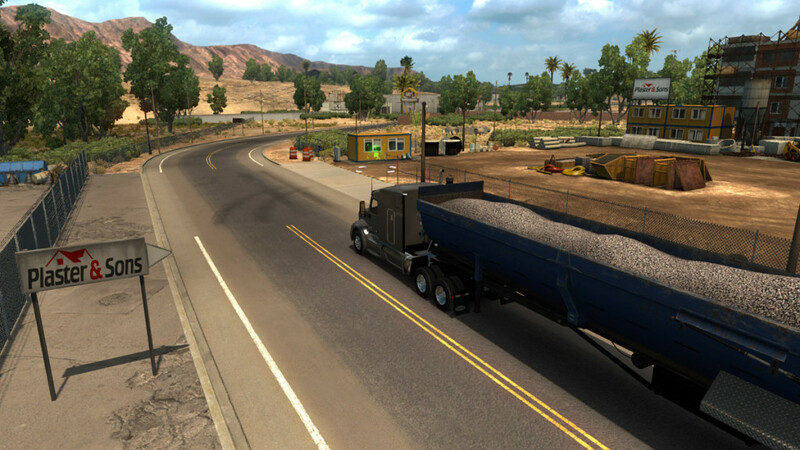 To give an idea of scale, the longest hauls can take close to approx 30-45 minutes depending on your driving and weather/time. Also a really nice Multiplayer mod at www.truckersmp.com. 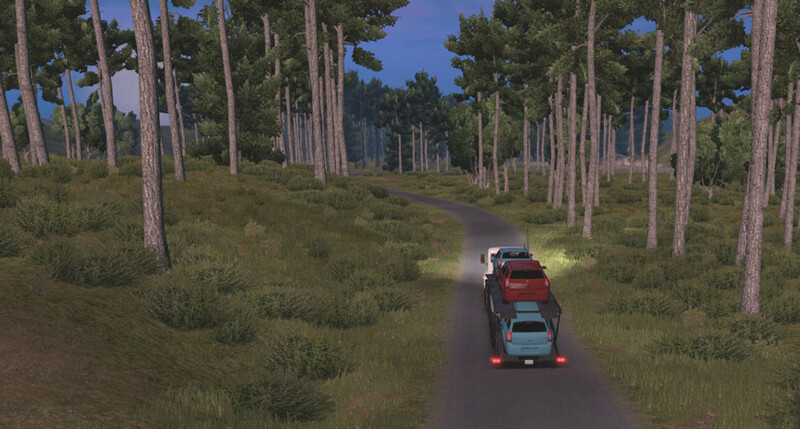 go convoy with your friends! It started with Spintires which I played a bit, and I was shocked to notice that I was excited to be able to park a truck with a long trailer somewhere. But I wonder, are those sims any good without a steering wheel? 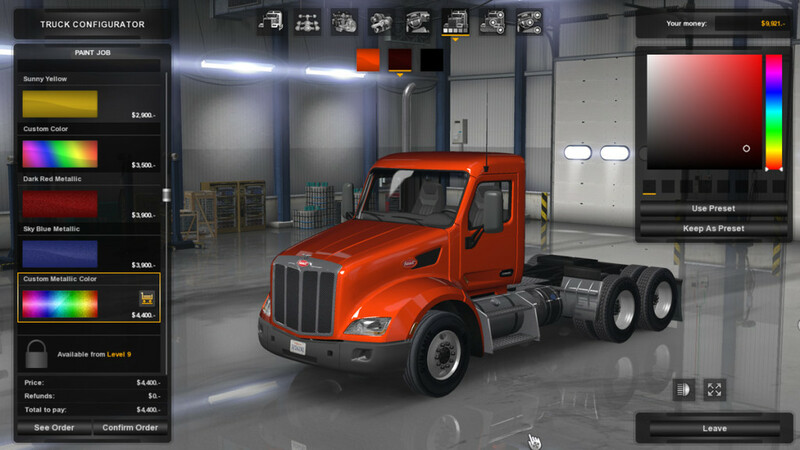 It works halfway decently in Spintires but I wonder about the other sims. 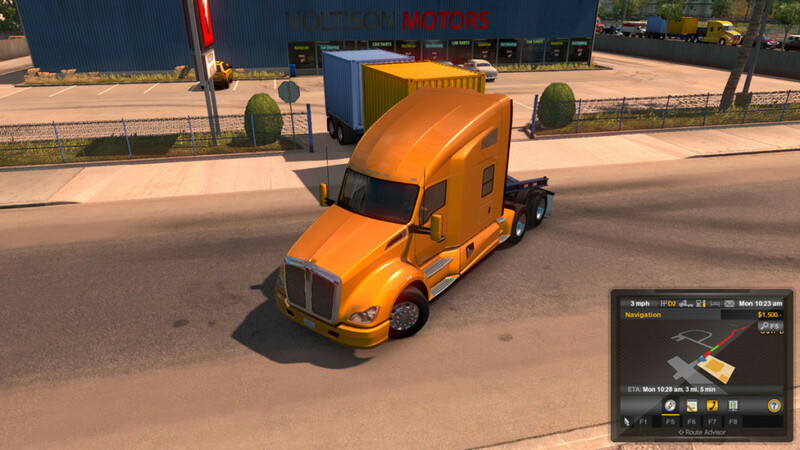 ATS is the most fun with a wheel ofcourse, but sometimes I don’t feel like setting up my wheel and just use the mouse or keyboard, it should work perfectly fine like that for most people. But, you can try for yourself, I’ve heard a demo has come out! 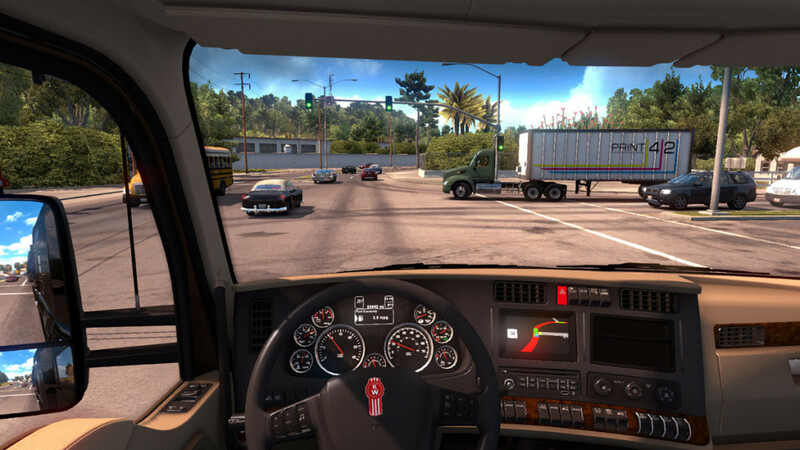 I play ETS 2 and ATS with a Xbox one controller. It works great! For Farming Sim I use the keyboard. 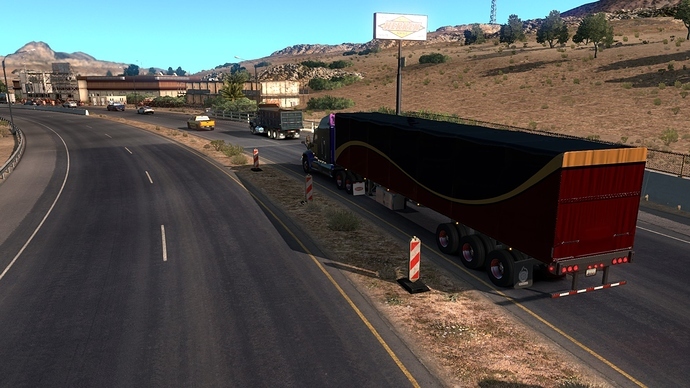 Just Nevada and Califorina but Arizonia is one the way as a free DLC. 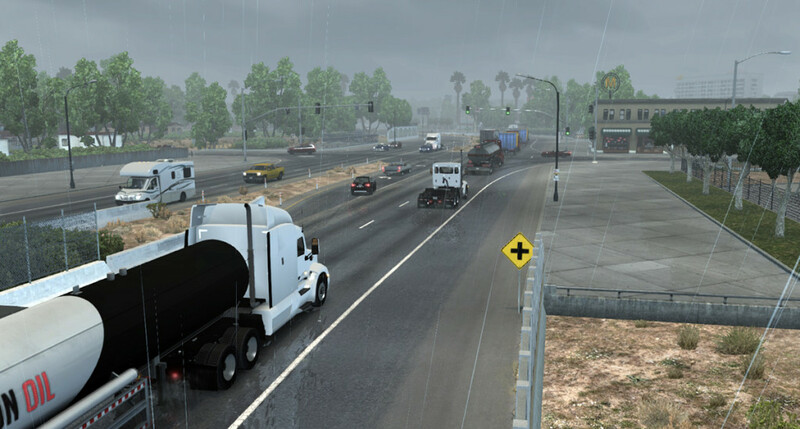 SCS said they will release other States as paid DLC and contiune to released based on sales. I’m just too lazy to break out my Momo and attach it to the desk. 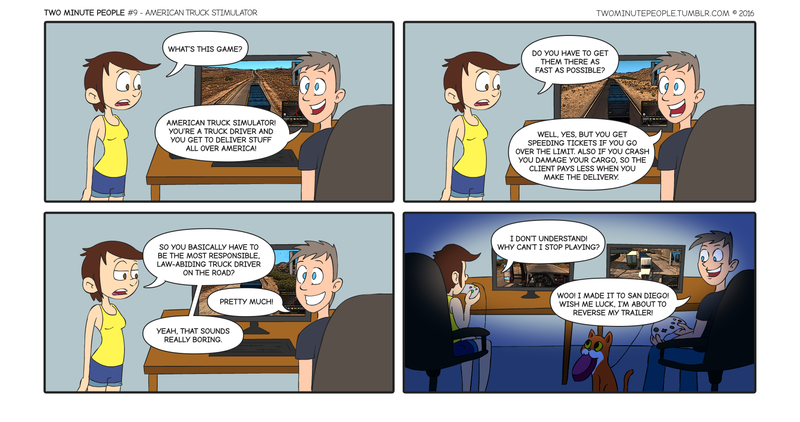 99.9% of the time this decides what sim or game I play. LOL! You should make it so the display and chair stays stationary and the control-setup rotates around! 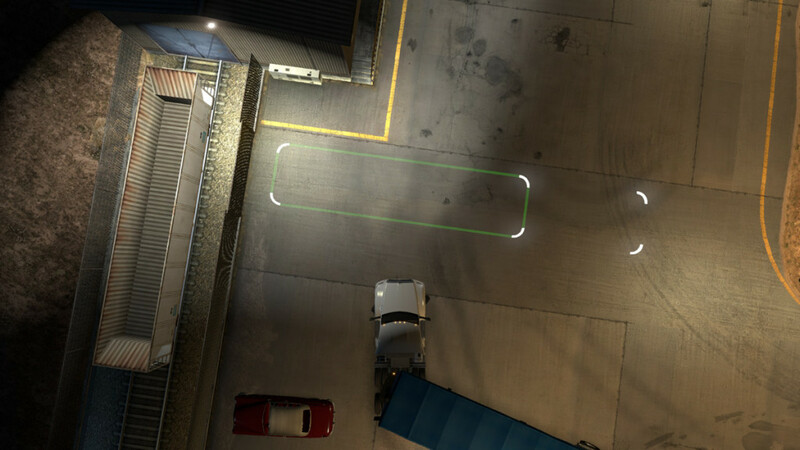 You have to do a 90 degree turn but as you can see cars park straight in front of the dock! 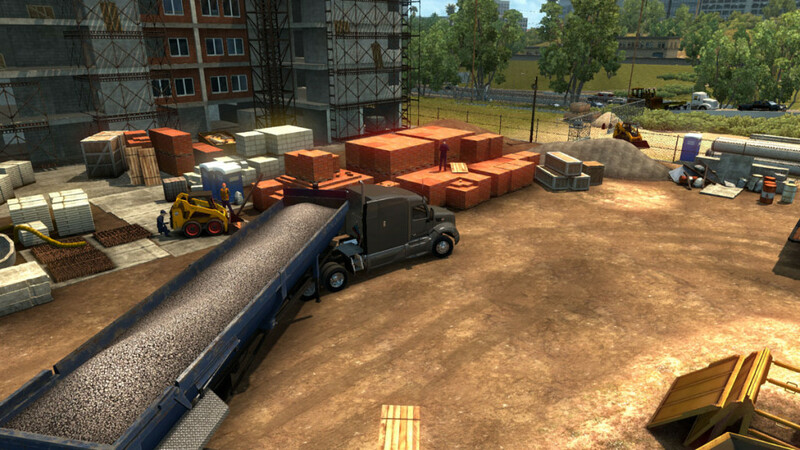 Anyway, I love parking in ETS2/ATS, it’s the most fun you can have with trucks! 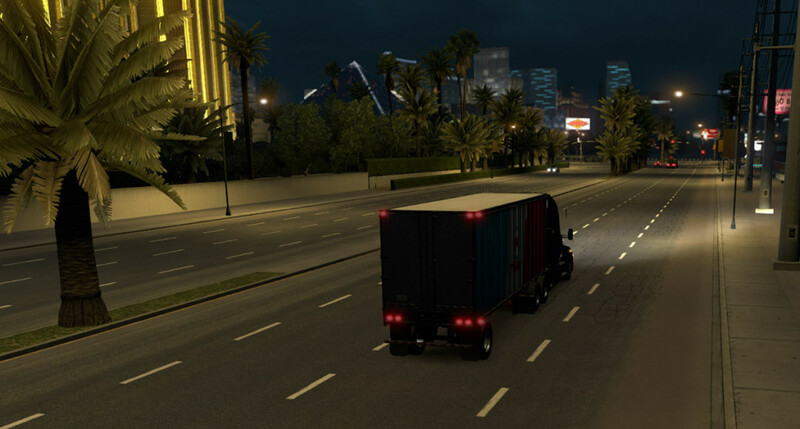 SCS Software's official blog - information, screens & movies from our truck simulator games. 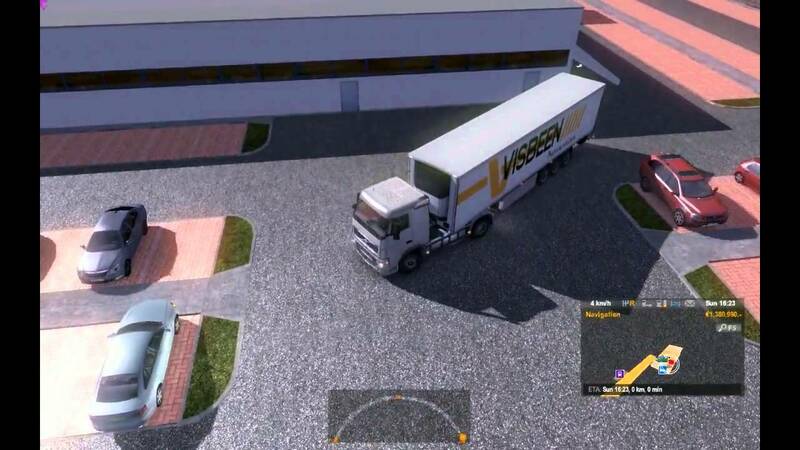 Euro Truck Simulator 2 news right from the authors. Arizonia is released, All be it in Beta but its out. 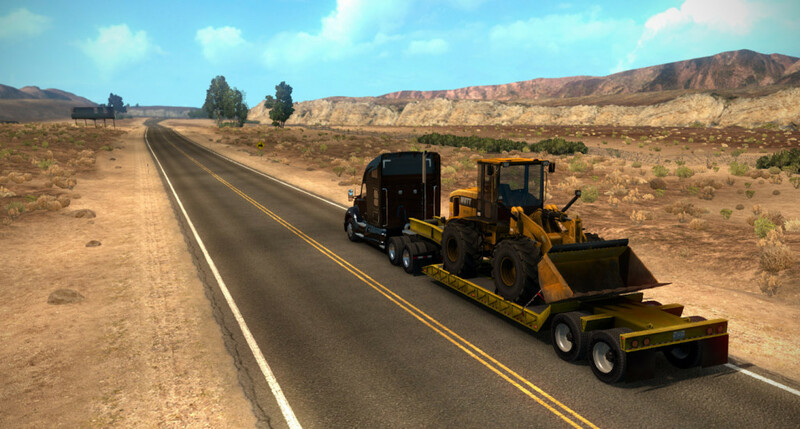 Some more game improvements as well, including advanced trailer coupling. 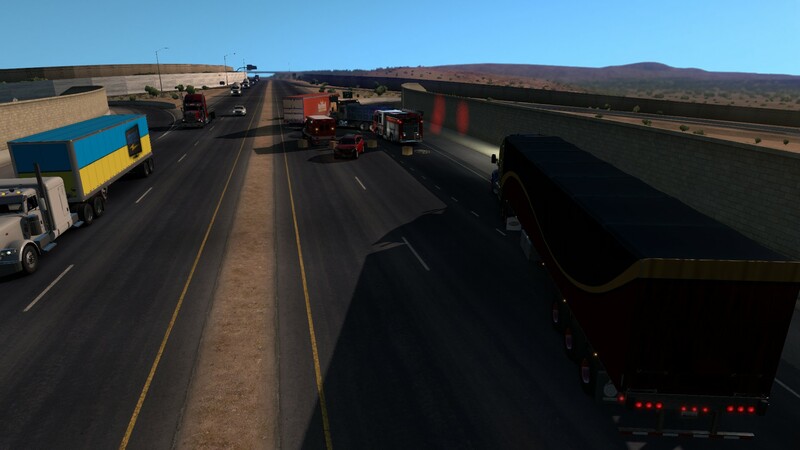 ATS and ETS 2 received the same updates minus Arizona. Both are in Public BETA right now. Other changes included updates to the way external contracts are handled. Before you had to leave the game and go to the website, now its all in game. 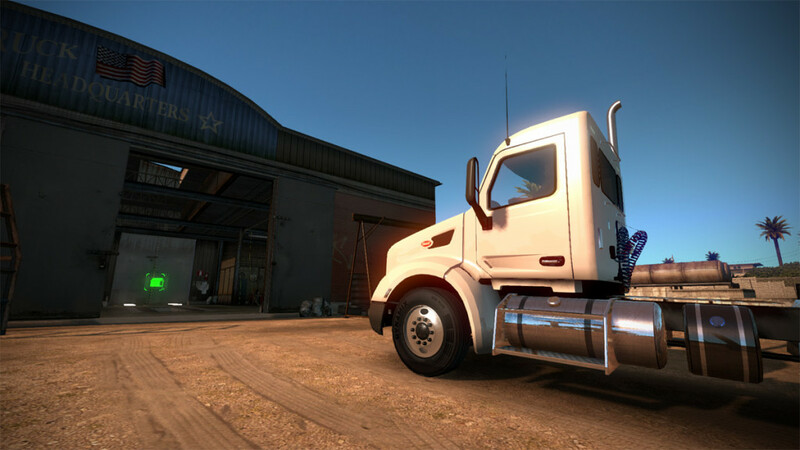 More updates coming this year including France and a new Renault Truck for ETS2 and if I was a betting man a New truck or two for ATS and maybe another state. I would like to see the I-10 run as well However that’s six states, Not sure if they have any more states in development. I wouldn’t mind seeing the I-5 finished off either though, That would only take two states(Oregon and Washington). 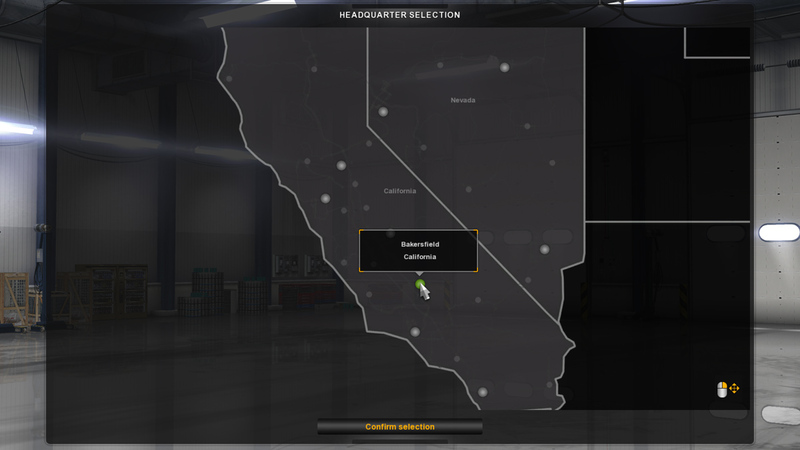 Im not so sure we would ever get all 50 states from SCS but the ones we do get will probably be awesome. Modders might fill in the rest. Ok, since I never played such a game I have to ask: Are those distances kinda shortened or are you really able (and/or forced) to drive the whole distance? …so no simulated wrecks that back up through the Grapevine…? Or pulling your hair out in rush hour traffic at the El Toro 5/ 405 split? What’s the fun in that? No wrecks but traffic is bad. 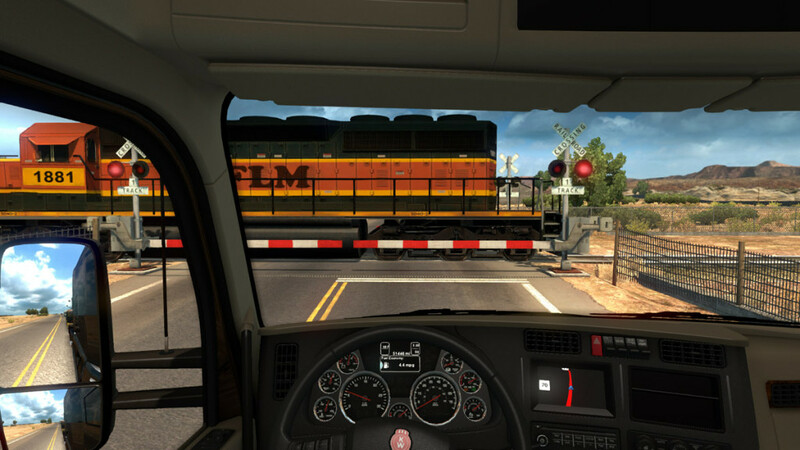 I sat at an intersection in Tonopah for about 30 mins real time. And very few traffic lights have left turn arrows. So If your not first or second in line to turn left it could be awhile. If you play multiplayer you can get some pretty spectacular crashes. They get cleared up quickly though. 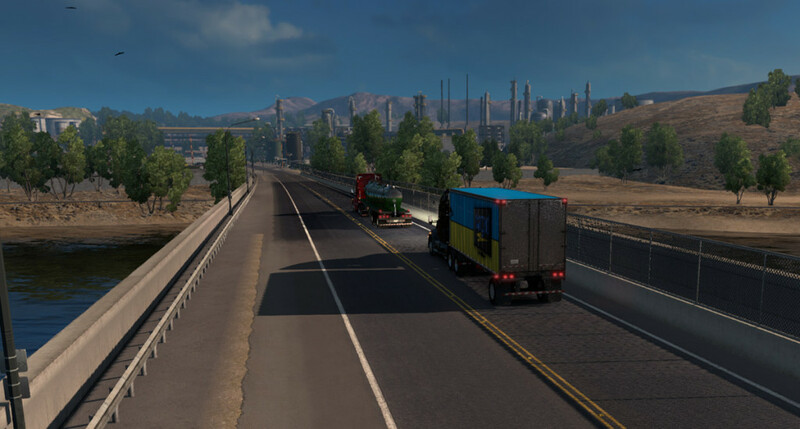 AZ map is out now! Oh god. So much to play so little time! Got it installed on my dads PC last week(selected beta in Steam) and he absolutely loves it! 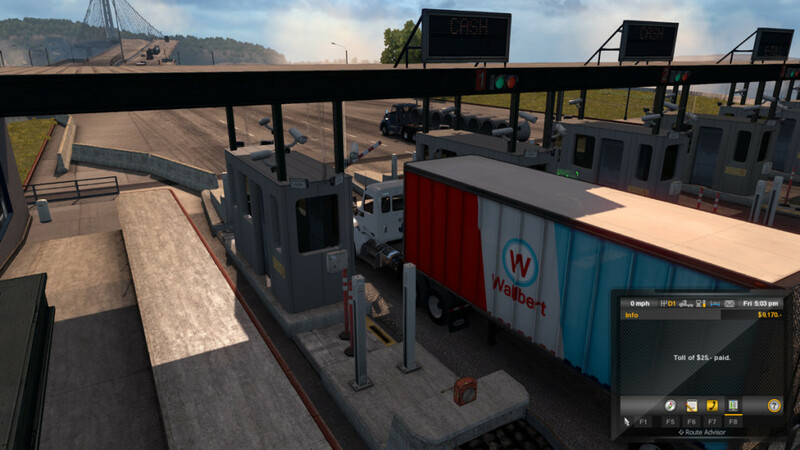 It was more a celebration of it being in full release, my father is absolutely addicted to ATS/ETS2 so I tend to look up new stuff for him to enjoy! 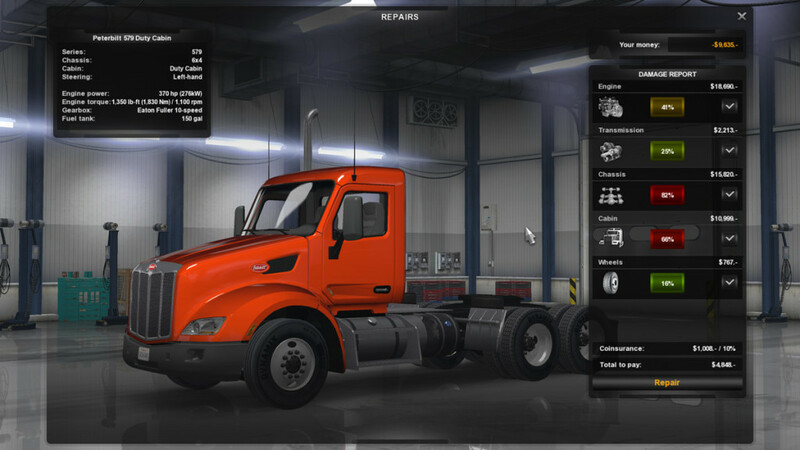 I have been playing ATS a bit lately and I have to say it seems an improvement of ETS. 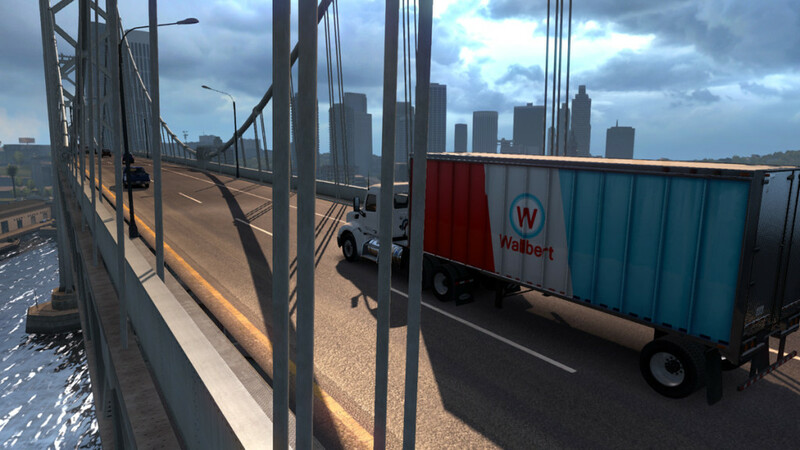 The trucks with the same tonnage of cargo in ATS feel more weighty (if that is a thing). I still have both in stalled but enjoying what is happening with ATS. Finally got to play some tonight. Seems to be a big improvement with the AZ map. Heck I even saw a protected left turn! Don’t remember which city it was, so can’t say if it was done properly or not though. But what a difference! I’m going to have to check this out. This might be my Father’s Day present to myself. This might be my Father’s Day present to myself. Yeah…sitting here trying to decide what do do for myself too. Ooooh new announcement, they are going to be going back over the 3 states and changing the scale from 1/35th to 1/20th, for free of course. I think i saw an easter egg. 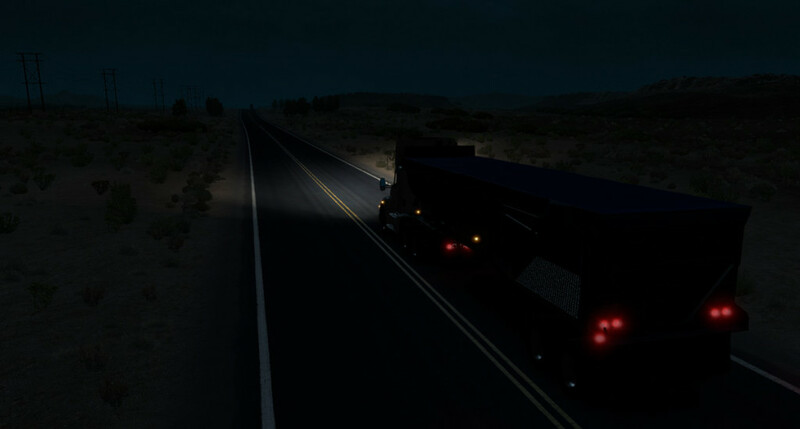 Plinking away through the desert (daytime) i guess in nevada somewhere. I wasn’t paying much attention, and there was no traffic, but something black shot accoss the sky low level insanely fast. It was gone by the time i realised something was happening. Anyone else seen it, and know what it is? i am guessing an area 51 easter egg or something. I have seen that. I thinks its just a fighter jet. Job completed and not the easiest of parking spaces with poles each side of the parking bay. Random encounters can mix things up a bit. Here is one, a nasty crash. Its blocking my exit. This trip there were 3 encounters. I had 2 blocked intersections (one by police barrier the other the afore mentioned crash), and a broken down car on the opposite side of the road which had no impact on traffic. Nice! I’ve been driving my Volvo around lately. 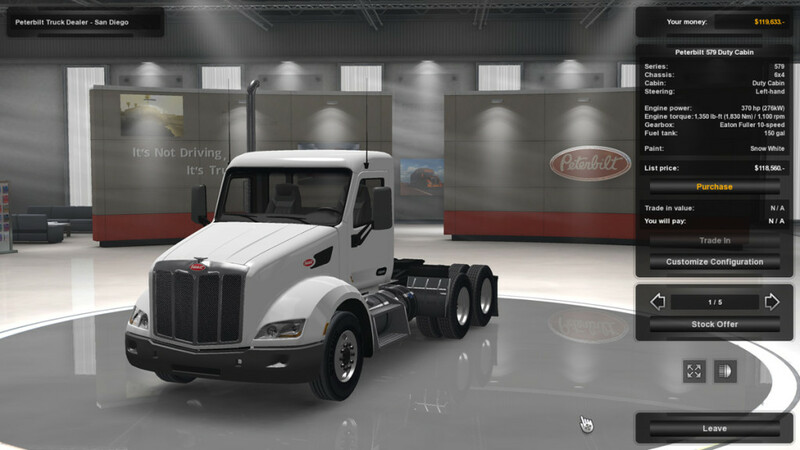 Pretty decent truck. Also SCS just announced the next state will be Washington. Which will be out sometime this year. Been hanging on the coast in Oregon, looks pretty good.